Kei raro iho nei ngā kōrero mēnā e hiahia ana koe kia whakauru mai āu tamariki ki tēnei kura. Tēnā, kia whakapā atu koe ki te tari i te tuatahi, ā ka whakamōhiotia atu he aha ngā mahi hei whakatutuki māu, waihoki mā rātou koe e āwhina ki te whakakī i ngā āputa o tēnei puka. Below is a copy of our enrolment for if you would like to enrol your children at our school. Please make contact with the office in the first instance; they will guide you with the next steps and can help with filling out the form. He nui ngā momo ara hei whai māu, hei whakamōhio mai ki a mātou mehemea kua kore tō tamaiti e tae atu ki te kura (he māuiui pea nōna, he kaupapa anō pea tā te whānau, te aha atu rānei). He mea nui kia whakamōhitia ngā matangaronga i mua tonu i te 9.30 karaka, ia te rā. Ki te kore e tae mai tētahi whakamārama, ka panonia hei matangaronga (whati-ture), ā kia tae noa mai te whakamārama a te whānau. There are many ways you can inform the office that your child is not going to be at school (they might be sick, or some other family reasons). It is really important that we are notified of any absentees no later than 9.30am each day. Any unexplained absences are automatically re-coded as truant until an explanation is provided. He pūmanawa tautono tā Te Whānau Tahi, e wātea ana ki raro iho nei. He nui ngā momo āhuatanga he whātoro atu māu, e ngāwari ake ai te whakapā mai ki te kura! Heoi anō tāu he kōwhiri i tētahi o ngā kōwhiringa (kei te āhua o te momo waea e hari nei koe - Apple (IOS) rānei, Android rānei). Te Whānau Tahi has a school App, available below. There are many features you can access, that help make getting in touch with us a whole lot easier! All you have to do is select one of the options (depending on what phone you have - Apple (IOS) or Android), and download the app. He mea nui kia kitea ā tātou tamariki me ngā kākahu tika. Kei raro iho nei te tauira o te kākahu tika. Ina hiahia koe ki te hoko i ētahi kākahu kura, tēnā whakapā atu ki te tari. Hei ara anō, pāwhiria te hononga kei raro nei, ka puta ai tētahi tono, ā, heoi anō tāu he īmera mai ki a mātou. It is important that all of our students wear correct uniform. Please see examples below. If you would like to purchase any uniform items, please contact the Tari. Alternatively you can download an order form below and email this through to us. Kei raro iho nei tā mātou wātaka, e wātea tūmatanui nei ki te ao. Ki konei kitea ai ngā rā matua, ngā hui, me ērā momo kaupapa nui o Te Whānau Tahi. Me he pātai āu, me whakapā atu koe ki te tari. Please see our below our calendar available to the public. 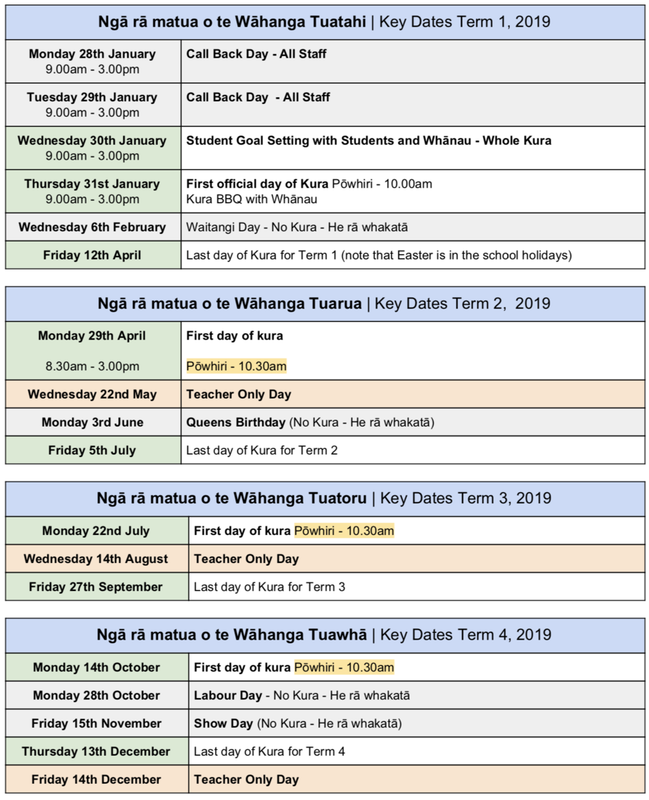 All key dates, hui, and important events are listed here. If you have any questions, please get make contact with our office.